Welcome to the on-line diary of our second 'assisted' self-build project. 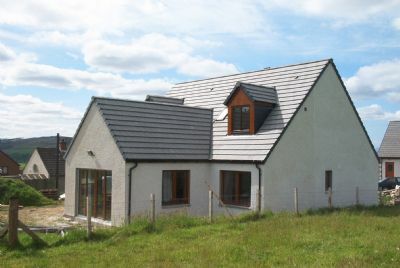 Following the completion of our Pool/Garage project in Dornoch we embarked on a more ambitious project to build a 160 m², 4 bedroom, 1½ storey house (named Cranachan*) in Bonar Bridge. The construction method was again timber frame structural walls with a blockwork exterior, and the detailed plans are available from the PLANS menu on the left. The build is now complete (we gained our completion certificate on Friday 14th September 2007) and we have now moved in. Our new house is very comfortable, warm and cosy. The air source heat pump has attracted a lot of interest locally and there are many more now being installed in the area. If you know us and would like to come and see the house (or stay over) then just drop us a line - we would be delighted to see you. P.S. 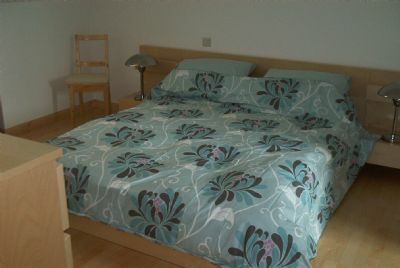 We are now in another project - two (semi-detatched) eco-friendly town houses in Cromarty. To see how we are getting on click here.